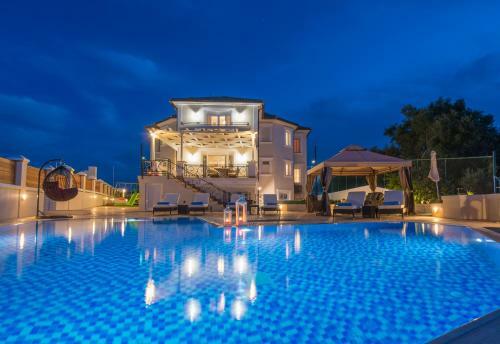 Frido Luxury Villa is located in Akrotiri, Zakynthos. Frido Luxury Villa offers to its guests garden, barbeque	and outdoor swimming pool. As for the kids are children playground, games room	and kid meals. The property offers family room, honeymoon suite and other might be available upon request. The rooms provide sea view, garden view and pool view. Room amenities include air-conditioning, heating, tv, satellite channels, fridge and more. In the kitchen there are hot plates, microwave, dishwasher, fridge, kitchen utensils, toaster and oven.